This topic contains instructions for solution implementers of a Microsoft cloud service who want to provide their Azure Active Directory (AD) users with sign-on validation using a SAML 2.0 compliant SP-Lite profile based Identity Provider as their preferred Security Token Service (STS) / identity provider. This is useful where the solution implementer already has a user directory and password store on-premises that can be accessed using SAML 2.0. This existing user directory can be used for sign-on to Office 365 and other Azure AD-secured resources. The SAML 2.0 SP-Lite profile is based on the widely used Security Assertion Markup Language (SAML) federated identity standard to provide a sign-on and attribute exchange framework. Microsoft supports this sign-on experience as the integration of a Microsoft cloud service, such as Office 365, with your properly configured SAML 2.0 profile based identity provider which we will henceforth refer to as the SAML 2.0 identity provider. SAML 2.0 identity providers are third-party products and therefore Microsoft does not provide support for the deployment, configuration, troubleshooting best practices regarding them. Once properly configured, the integration with the SAML 2.0 identity provider can be tested for proper configuration by using the Microsoft Connectivity Analyzer Tool which is described in more detail below. For more information about your SAML 2.0 SP-Lite profile based identity provider, ask the organization that supplied it. Third party SAML Providers are supported with Modern Auth Office 365 clients without having the need to validate them with the Works with Office 365 program. For more information see Office 365 SAML 2.0 Federation Implementer’s Guide. Microsoft Outlook 2010, Microsoft Outlook 2013, Word 2013, Excel 2013, PowerPoint 2013, Skype for Business 2013, Publisher 2013, Viso 2013, Access 2013, Project 2013, and OneDrive for Business Sync Client. All other clients are not available in this sign-on scenario with your SAML 2.0 Identity Provider. For example, the Lync 2010 desktop client is not able to login into the service with your SAML 2.0 Identity Provider configured for single sign-on. This topic contains detailed requirements on the protocol and message formatting that your SAML 2.0 identity provider must implement to federate with Azure AD to enable sign-on to one or more Microsoft cloud services (such as Office 365). The SAML 2.0 relying party (SP-STS) for a Microsoft cloud service used in this scenario is Azure AD. We recommend ensuring that your SAML 2.0 identity provider output messages be as similar to the provided sample traces as possible. Also, use specific attribute values from the supplied Azure AD metadata where possible. 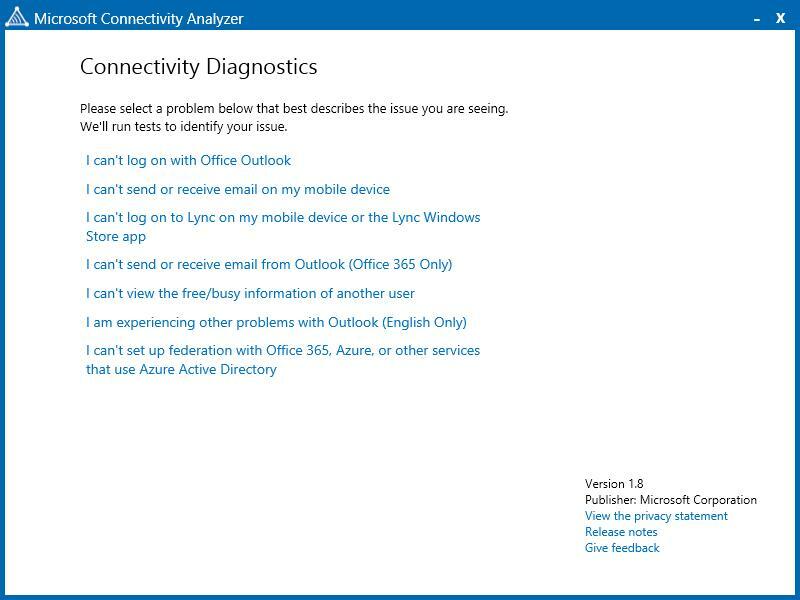 Once you are happy with your output messages, you can test with the Microsoft Connectivity Analyzer as described below. The Azure AD metadata can be downloaded from this URL: https://nexus.microsoftonline-p.com/federationmetadata/saml20/federationmetadata.xml. For customers in China using the China-specific instance of Office 365, the following federation endpoint should be used: https://nexus.partner.microsoftonline-p.cn/federationmetadata/saml20/federationmetadata.xml. This section details how the request and response message pairs are put together in order to help you to format your messages correctly. Azure AD can be configured to work with identity providers that use the SAML 2.0 SP Lite profile with some specific requirements as listed below. Using the sample SAML request and response messages along with automated and manual testing, you can work to achieve interoperability with Azure AD. The RSA-sha1 algorithm must be used as the DigestMethod. Other digital signature algorithms are not accepted. You may also sign the XML document. HTTPS is the required transport. Azure AD will use HTTP POST for the authentication request to the identity provider and REDIRECT for the Logoff message to the identity provider. This table shows requirements for specific attributes in the SAML 2.0 message. This is required to be a URI of the identity provider. You should not reuse the Issuer from the sample messages. If you have multiple top-level domains in your Azure AD tenants the Issuer must match the specified URI setting configured per domain. Azure AD currently supports the following NameID Format URI for SAML 2.0:urn:oasis:names:tc:SAML:2.0:nameid-format:persistent. A request and response message pair is shown for the sign-on message exchange. This is a sample request message that is sent from Azure AD to a sample SAML 2.0 identity provider. The sample SAML 2.0 identity provider is Active Directory Federation Services (AD FS) configured to use SAML-P protocol. Interoperability testing has also been completed with other SAML 2.0 identity providers. This is a sample response message that is sent from the sample SAML 2.0 compliant identity provider to Azure AD / Office 365. This topic contains guidelines on how to configure your SAML 2.0 identity provider to federate with Azure AD to enable single sign-on access to one or more Microsoft cloud services (such as Office 365) using the SAML 2.0 protocol. The SAML 2.0 relying party for a Microsoft cloud service used in this scenario is Azure AD. Your SAML 2.0 identity provider needs to adhere to information about the Azure AD relying party. Azure AD publishes metadata at https://nexus.microsoftonline-p.com/federationmetadata/saml20/federationmetadata.xml. It is recommended that you always import the latest Azure AD metadata when configuring your SAML 2.0 identity provider. Note that Azure AD does not read metadata from the identity provider. You have to enable communication between your SAML 2.0 identity provider and Azure AD. This configuration will be dependent on your specific identity provider and you should refer to documentation for it. You would typically set the relying party ID to the same as the entityID from the Azure AD metadata. Verify the clock on your SAML 2.0 identity provider server is synchronized to an accurate time source. An inaccurate clock time can cause federated logins to fail. After you have configured your SAML 2.0 identity provider for use with Azure AD sign-on, the next step is to download and install the Azure Active Directory Module for Windows PowerShell. Once installed, you will use these cmdlets to configure your Azure AD domains as federated domains. The Azure Active Directory Module for Windows PowerShell is a download for managing your organizations data in Azure AD. This module installs a set of cmdlets to Windows PowerShell; you run those cmdlets to set up single sign-on access to Azure AD and in turn to all of the cloud services you are subscribed to. For instructions about how to download and install the cmdlets, see http://technet.microsoft.com/library/jj151815.aspx. Before configuring federation on an Azure AD domain, it must have a custom domain configured. You cannot federate the default domain that is provided by Microsoft. The default domain from Microsoft ends with “onmicrosoft.com”. You will run a series of cmdlets in the Windows PowerShell command-line interface to add or convert domains for single sign-on. Each Azure Active Directory domain that you want to federate using your SAML 2.0 identity provider must either be added as a single sign-on domain or converted to be a single sign-on domain from a standard domain. Adding or converting a domain sets up a trust between your SAML 2.0 identity provider and Azure AD. The following procedure walks you through converting an existing standard domain to a federated domain using SAML 2.0 SP-Lite. Note that your domain may experience an outage that impacts users up to 2 hours after you take this step. Connect to your Office 365 tenant as a tenant administrator: Connect-MsolService . NOTE: You can obtain the signing certificate base64 encoded string from your IDP metadata file. An example of this location has been provided but mat differ slightly based on your implementation. For more information about “Set-MsolDomainAuthentication”, see: http://technet.microsoft.com/library/dn194112.aspx. You must run use “$ecpUrl = “https://WS2012R2-0.contoso.com/PAOS“” only if you set up an ECP extension for your identity provider. Exchange Online clients, excluding Outlook Web Application (OWA), rely on a POST based active end point. If your SAML 2.0 STS implements an active end point similar to Shibboleth’s ECP implementation of an active end point it may be possible for these rich clients to interact with the Exchange Online service. Once federation has been configured you can switch back to “non-federated” (or “managed”), however this change takes up to two hours to complete and it requires assigning new random passwords for cloud based sign-in to each user. Switching back to “managed” may be required in some scenarios to reset an error in your settings. For more information on Domain conversion see: http://msdn.microsoft.com/library/windowsazure/dn194122.aspx. Before you can authenticate your users to Office 365 you must provision Azure AD with user principals that correspond to the assertion in the SAML 2.0 claim. If these user principals are not known to Azure AD in advance then they cannot be used for federated sign-in. Either DirSync or Windows PowerShell can be used to provision user principals. The DirSync Tool can be used to provision principals to your domains in your Office 365 tenant from the on-premises Active Directory. For more detailed information, check out: http://technet.microsoft.com/library/hh967642.aspx. Windows PowerShell can also be used to automate adding new users to Azure AD and to synchronize changes from the on-premises directory. To use the Windows PowerShell cmdlets you must download the Azure Active Directory Modules which can be obtained here: http://technet.microsoft.com/library/jj151815.aspx. This procedure shows how to add a single user to Azure AD. Connect to your Office 365 tenant as a tenant administrator: Connect-MsolService. For more information about “New-MsolUser” check out, http://technet.microsoft.com/en-us/library/dn194096.aspx. The “UserPrinciplName” value must match the value that you will send for “IDPEmail” in your SAML 2.0 claim and the “ImmutableID” value must match the value sent in your “NameID” assertion. After setting up single sign-on with your SAML 2.0 SP-Lite based identity Provider, you should verify that it is working correctly. Before you verify single sign-on, you should finish setting up Active Directory synchronization, synchronize your directories, and activate your synced users. If you are using DirSync, see Directory synchronization roadmap. To verify that single sign-on has been set up correctly, you can perform the following procedure to confirm that you are able to sign in to the cloud service with your corporate credentials. Microsoft provides guidance on TechNet for testing AD FS at Test single sign-on for different usage scenarios. 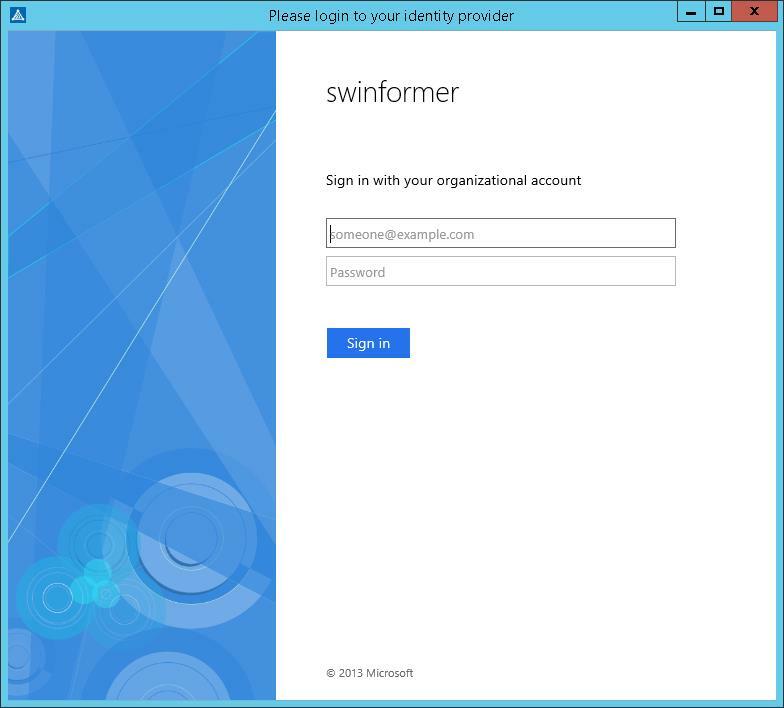 Microsoft has provided a tool that you can use to test your SAML 2.0 based identity provider. Before running the test tool you must have configured an Azure AD tenant to federate with your identity provider. The Connectivity Analyzer requires Internet Explorer 10 or later. 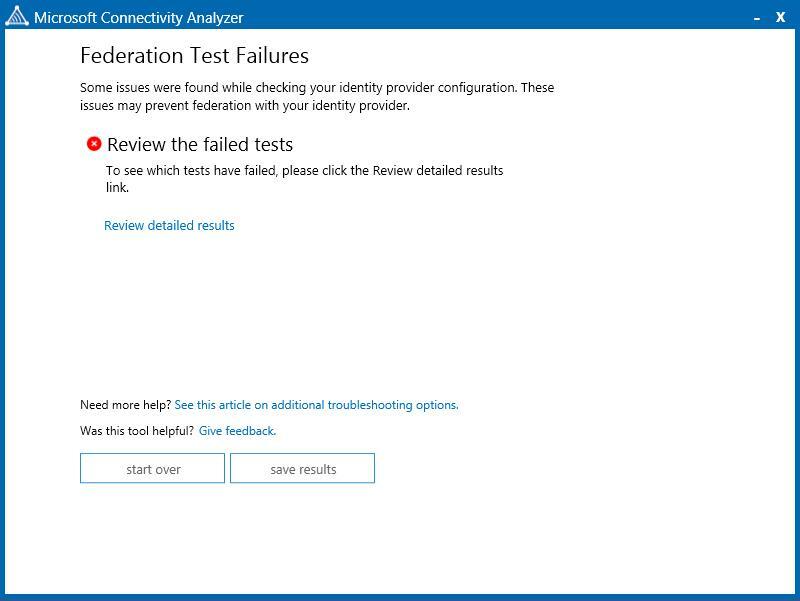 Download the Connectivity Analyzer from, https://testconnectivity.microsoft.com/?tabid=Client. Click Install Now to begin downloading and installing the tool. Here is a screenshot of the tool after it has been downloaded and started. Select “I can’t set up federation with Office 365, Azure, or other services that use Azure Active Directory”. Once the tool is downloaded and running, you will see the Connectivity Diagnostics window. The tool will step you through testing your federation connection. At the Federation test sign-in window you should enter an account name and password for the Azure AD tenant that is configured to be federated with your SAML 2.0 identity provider. The tool will attempt to sign-in using those credentials and detailed results of tests performed during the sign-in attempt will be provided as output. This window shows a failed result of testing. Clicking on Review detailed results will show information about the results for each test that was performed. You can also save the results to disk in order to share them. 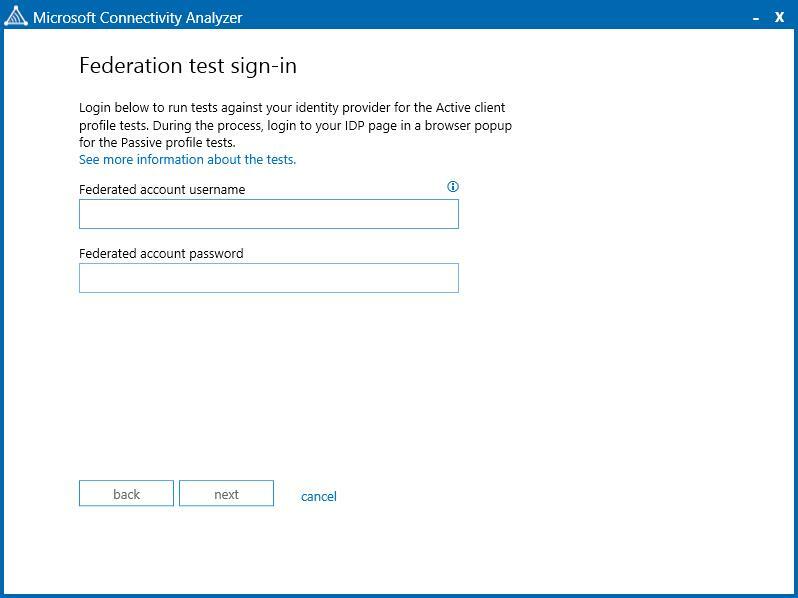 The Connectivity analyzer also tests Active Federation using the WS*-based and ECP/PAOS protocols if you are not using these you can disregard the following error: Testing the Active sign-in flow using your identity provider’s Active federation endpoint. Manual verification provides additional steps that you can take to ensure that your SAML 2.0 identity Provider is working properly in many scenarios. On a domain-joined computer, sign in to your cloud service using the same logon name that you use for your corporate credentials. Click the Sign in at <your company> link. If you are able to sign in, then single sign-on has been set up.